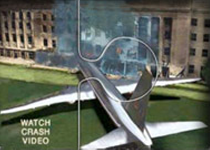 There being little question that the â€œterroristâ€ attacks on the World Trade Center and the Pentagon were not carried out by Muslim â€œextremistsâ€ but by one or more intelligence agencies as a false-flag operation, it follows immediately that the official story of 9/11 would have to be protected from public disclosure of contradictory forensics by a variety of psy-op techniques, some deployed in the mainstream media (denial and rhetoric) and some deployed within the â€œ9/11 Movementâ€ itself. In this section we focus on the latter theater of operations. A common psy-op technique called â€œwell-poisoningâ€ works like this: Seemingly well-meaning â€œinvestigatorsâ€ join the growing crowd of skeptics only to propose ideas that are far enough beyond the pale to draw ridicule upon the effort as a whole. Here is a list of such proposals. Some of them may be sincere, some not. Since there is no foolproof way to detect a well-poisoning operation carried out by experts, we make no attempt to specify which is which but opt, instead, to label these proposals collectively as â€œdefacto disinfoâ€. 2. The massive destruction of the twin towers required an amount of energy that could only be produced by space-based â€œdirected energyâ€ weapons of an unknown type. (The required energy was well within the capacity of military grade nanothermite (already detected), not to mention various well-known high explosives or other localized (and local) sources of high energy production. 3. Vehement denial that a smaller aircraft or missile struck the Pentagon instead of Flight AAL 77. (This, in spite of very clear evidence that no large passenger liner could possibly be responsible for the weak damage pattern at the Pentagon C-ring. 4. Attempts to discredit the well-established findings of nanothermite residues in the WTC dust by ill-informed rhetorical attacks on the word â€œnanothermiteâ€. Visitors are urged to read the following documents posted in this section. They point out the fallacies in some of the above proposals and we are adding analyses as they become available. We offer no apologies to the well-meaning (if there are any). They should know better.